Our staff at Main Street Auto can recommend the best battery for the type and model of your vehicle while taking into consideration the way your vehicle is driven. Our staff will make sure your new battery is installed correctly. Vehicle batteries are designed to be charged, discharged, and recharged repeatedly utilizing a reversible chemical reaction between the lead and the acid housed inside the battery. Although not the most efficient way to store electricity they are inexpensive to manufacture and they provide very large amounts of on-demand current making it specifically suited for use in cars and trucks. Components in a vehicle's electrical system include an alternator, a voltage regulator and a variety of electrical circuits. 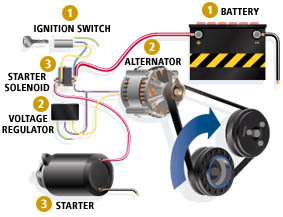 A vehicle's charging system uses an alternator that is driven by a fan belt attached to the engine to create electrical energy that provides power for the electrical system and recharges the battery once the engine is cranked. A voltage regulator is designed to maintain a consistent voltage level for the electrical system. The starting system uses more electrical power than any other system or component in a vehicle. Turning the key in the vehicle's ignition activates voltage to move from the battery to the starter control circuit which then activates the starter solenoid, which then energizes the electric starter motor. The vehicle's battery powers the starter motor. The motor requires a very high electric current to turn over the engine, therefore having a battery with sufficient power is crucial. The starter solenoid also moves the starter gear forward to connect with the engine flywheel or (flex-plate for an automatic transmission) which is attached to the engine crankshaft. As the starter motor spins it turns over the engine crankshaft that enables the vehicle's engine to start.